Dominos related to 2018-2019 Monster Energy NASCAR Cup Series silly season continue to fall, the most recent one coming with Roush Fenway Racing owner Jack Roush’s revelation Wednesday evening that Trevor Bayne will not drive his No. 6 Ford next season. Other confirmations include the closure of Furniture Row Racing closure that led to the displacement of reigning series champion Martin Truex Jr., the retirement of Kasey Kahne, the revelation by Chip Ganassi Racing owner Chip Ganassi that Jamie McMurray won’t be the driver of the No. 1 next year and Matt DiBenedetto’s announcement that he would leave Go FAS Racing at the end of the season. I think there’s something to the reports of Truex, along with crew chief Cole Pearn and sponsor Bass Pro Shops, to Joe Gibbs Racing to take over the No. 19 from Daniel Suarez. There has been no “official” news, but that move is looking at least somewhat certain, considering the circumstances of FRR’s closure (owner Barney Visser listed Joe Gibbs’ increased charge for their technical alliance among reasons for his team’s demise). Looks to me like JGR jacked up the price on Visser to drive one of his biggest competitors out of business. Why not take the reigning champ while he’s at it. Kahne’s retirement leaves the No. 95 Leavine Family Racing seat vacant. Car owner Bob Leavine has made no secret of the face he wants to switch to Toyota. It stands to reason that such a manufacturer switch may include a technical alliance with Joe Gibbs Racing. With such an alliance, I see Suarez landing in the No. 95. Will LFR become the next Furniture Row Racing? After all, FRR was once an outsider, and it hit the big time with a JGR alliance in 2016. I see Matt Kenseth returning to full-time competition to drive the No. 6 at Roush Fenway. Roush is big on Kenseth, and when he rehired his former driver in May, it had the feel of a love affair between owner and former driver. At the very least, I think Kenseth will be in the No. 6 part-time next season. I’m guessing it’s probably Kenseth’s call how often he’ll be in that car next year. I think the NASCAR XFinity Series is more suited to Bayne. JR Motorsports has a ride available with Elliott Sadler’s retirement. That ride is reportedly going to Noah Gragson, but that possible move hasn’t been made official. If that doesn’t happen, I could see Bayne there with backer Advocare. If Gragson does wind up at JRM, maybe Roush will make room for him in an Xfinity ride. If Bayne is determined to stay in the Cup Series, maybe the No. 32 Go FAS Racing ride being vacated by DiBenedetto will be an option. Speaking of DiBenedetto, I see him as the Ryan Preece of the Cup Series. DiBenedetto said he’s leaving Go FAS Racing to keep his options open for bigger and better opportunities. Preece gave up a full-time ride with an underfunded team a couple years ago. Since then, he’s been racing part-time for powerhouse Joe Gibbs Racing. Such opportunities are a rarity in the Cup Series, as the big-time Cup teams utilize the services of full-time drivers, but that may be DiBenedetto’s only shot, unless he considers Xfinity an option. Or, if Kenseth wants to continue racing but only part-time, maybe he’ll share the No. 6 seat with DiBenedetto. That brings me to Chip Ganassi Racing. I have a gut feeling that McMurray’s going to be another retiree at the end of 2018, at least when it comes to full-time competition. Ganassi confirmed he offered McMurray and administrative role within his organization, along with a Daytona 500 opportunity and, perhaps, other starts here and there. I don’t think Ganassi would’ve made that offer if he didn’t have an inkling that McMurray was considering calling it a career. Kurt Busch has been speculated as McMurray’s replacement at Ganassi. According to Busch, he’s been in talks with two teams but hasn’t signed a deal, yet. 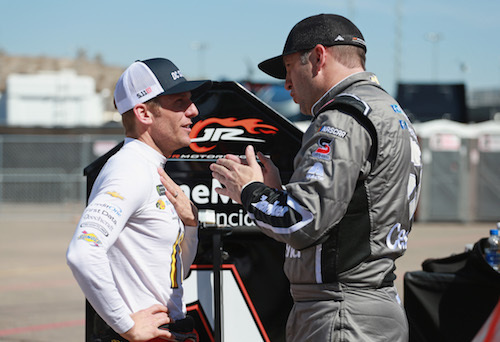 He hasn’t revealed which two teams he’s talking to, but one of them may be his current team, Stewart-Haas Racing, since he’s in a contract year. After all, an SHR official said earlier this year that the hope was to keep all four of its drivers beyond 2018. If Busch jumps ship to CGR, I wouldn’t be surprised if Stewart-Haas scales back to a three-car operations. After all, the reason for that fourth team, the No. 41, was team co-owner Gene Haas wanted Kurt Busch became available. Haas wanted Busch so bad that, at first, he footed the bill for the No. 41. He continues to pay part of the sponsorship bill. If Busch becomes unavailable, would Haas still be interested in running that fourth team, especially since he now has a Formula-1 team to play with, now?